Heat oven to 350°F. Line bottom and sides of 9-inch square pan with foil, leaving 1 inch of foil overhanging at 2 opposite sides of pan. In medium bowl, place flour. Cut in butter using pastry blender (or pulling 2 table knives through ingredients in opposite directions), until evenly mixed. Stir in nuts. In bottom of pan, press mixture evenly. Bake about 15 minutes or until light golden brown. Cool completely. Spoon sorbet over crust; spread evenly. Place in freezer. In medium bowl, mix ice cream, lemonade concentrate, 1 cup whipped topping and the food color until well blended. Fold in 1 cup raspberries. Spread over sorbet. Freeze about 4 hours or until firm. Let stand at room temperature about 10 minutes before cutting. Remove dessert from pan, using foil to lift. Dip knife into hot water before cutting serving pieces. 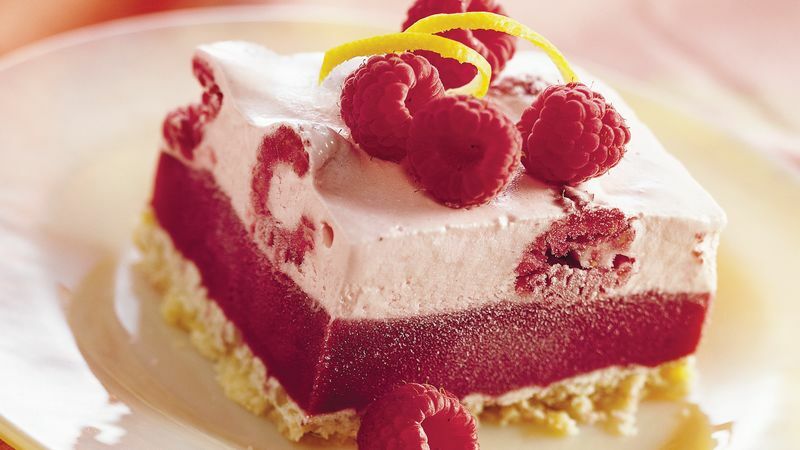 Garnish with additional whipped topping and raspberries. Store in freezer.